Arrive at the Juan Santamaría International Airport (SJO) before 1:00 pm. 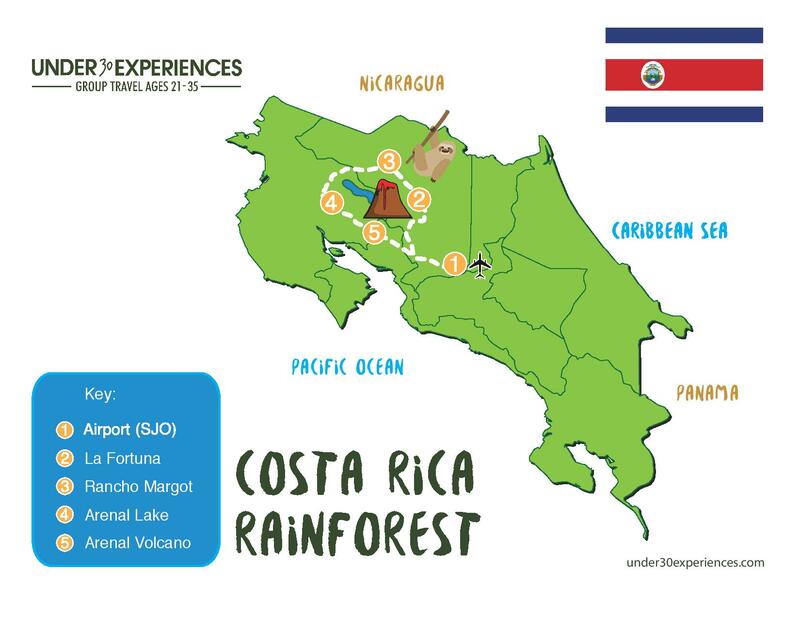 Your Trip Leader will pick you up from San Jose International Airport and we’ll head to the rainforest! (~3.5 hour drive). If you are prone to motion sickness we suggest taking any medication before the drive. It’s a beautiful drive through the mountains of Costa Rica. Stop for souvenirs and snacks in Los Angeles Cloud Forest as you marvel at all the lush, green mountains around you. Your yoga teacher will lead an “Intention Setting Exercise” to get help the group set the energy for the upcoming days. Get to know the other like-minded travelers on the trip as we prepare to grow ourselves physically, mentally, and spiritually. Wake up to the sounds the rainforest and head to the yoga deck to begin the day with some light yoga and mobility work to recover after your flight. Enjoy your first delicious breakfast at the eco-lodge, fresh coffee, organic fruit, eggs and homemade breads await for you. Explore the grounds on a Tour of the eco-lodge, learn all about permaculture and the use of sustainable sources of energy and good ecological practices while taking in the great views of the surrounding mountains. After a nice morning walk around the property, enjoy a tasty lunch at the eco-lodge. After lunch you can hike to El Mirador lookout point or visit the town of El Castillo and enjoy breathtaking views of the Arenal Lake or just relax by the pool or hammock. Participate on your first mindfulness session followed by a grounding yoga class in the beautiful deck surrounded by nature. Take the evening to get to know your new friends by the natural pools at the ranch while looking at the stars. Begin to dive deeper into your yoga practice as you feel energized on your third day surrounded by trees and the sound of the river. Enjoy the delightful Costa Rican morning flavors with a delicious coffee and a plate of fresh tropical fruits. Make your own excursion out in nature! Go zip lining, horseback riding, or just enjoy a relaxing massage (not included). Take part in the 2nd mindfulness session followed by a relaxing restorative yoga class. After a full day of activities, enjoy another wonderful dinner at the eco-lodge and get ready for another day of adventures out in the wild tomorrow. Take a dip in the natural pools or join the group for an evening discussion and recap of the day. Wake up to a fun yoga flow class, that will leave you both energized and grounded. Enjoy an organic breakfast grown right on the property. Spend the morning relaxing at the eco-lodge or choose to hike the Arenal Observatory Lodge trails or kayak in Lake Arenal (not included). Fuel yourself with another delicious, local, and organic lunch at the eco-lodge. Join us for another mindfulness session followed by a calming yoga class after a beautiful day of exploring Costa Rica’s countryside. Tonight you’ll enjoy another delicious dinner at the eco-lodge. Dive deeper into your mindfulness discussions as we seek to create an open community for people to open up and feel supported. Enjoy your last Vinyasa Flow class surrounded by the amazing Costa Rican rainforest. Start your last day fully energized after an organic and natural breakfast. Explore the ecolodge trails or join another epic rainforest adventure. Enjoy a healthy and filling lunch at the ranch. Spend the afternoon walking around the gardens, visit the relaxing hot springs or join your group for another adventure from the Ranch. Join us for a beautiful healing closing ceremony before you depart tomorrow. Enjoy your last dinner in Costa Rica and continue to connect with like-minded friends. Tonight you’ll enjoy the closing dinner at the eco-lodge with your new friends where you will all share your best moments of the adventure. During your mindfulness talk, think of all the things you’ve achieved during the week and share them with your new friends. One final delicious breakfast at the eco-lodge before you head back home a refreshed person. Don’t forget your motion sickness medication if needed. We'll depart at 7:15 am for Juan Santamaría International Airport (~3.5 hour drive). Be sure your flight departs after 12:30 pm.